Zakynthos, the jewel of the Ionian Sea, is home to some of the most photographed and unique places in Greece. 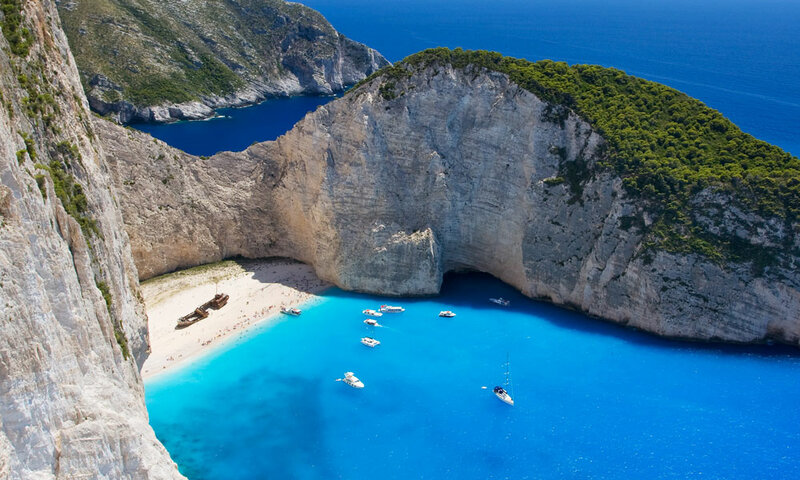 The enchanting Shipwreck Bay, the stunning Blue Caves, and the Caretta Caretta turtles are some of the most popular natural attractions that Zante has to offer. 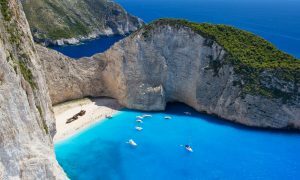 If you are visiting Zante for a day as part of your Cruise Liner holiday schedule, Nefis Travel Zakynthos offers the most exclusive and unique Shore Excursion trips. 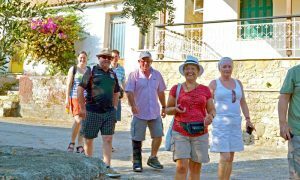 With our fantastic guiding expertise and thorough knowledge of the island Zakynthos, we can tailor make the schedule for you. 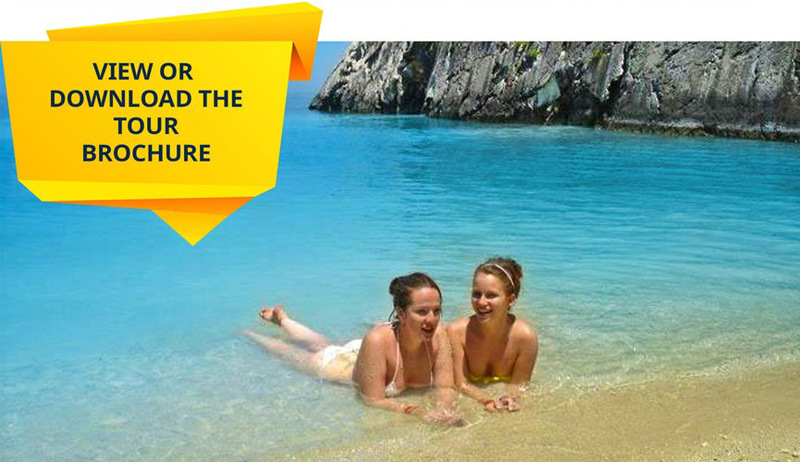 Our recommended Shore Experience trip is a combination of the Nefis Travel Zakynthos VIP Shipwreck and Blue Caves excursion together with our Back to the Roots - Zakynthos island tour. This way you are able to seeing the most famous sites on the island with some of the true hidden treasures that Zakynthos has to offer. Throughout our tours we include interesting historical facts about the island of Zante, Greek Mythology and when time allows us, traditional Zakynthian folksongs played specially for you! You will be collected by the Nefis Travel Zakynthos Mini-Bus at the port in Zante Town, Zakynthos. We pick you up from the tender boat harbour side and deliver you back here at the end of the shore excursion. Leaving Zante Town, driving up the east coast of Zakynthos island, your first stop on will be a fantastic photo opportunity at the top of the Alykes Hills. From here you can see all over the island of Zakynthos, as well as the main land of Greece and the neighbouring island of Kefallonia. After enjoying a beautiful drive along the northern coast of Zante we will stop in the region of the traditional village of Micro Nisi to board the boat for Shipwreck Bay and the Blue Caves. You will have a view of this charming Greek Island village as we make our way out to sea. The Nefis Travel Zakynthos shore excursion, features a ride on a highly secure and ultra-fast speedboat with a glass bottom. Our first stop of the day is Shipwreck Bay. On our way we are often lucky enough to spot some dolphins and even the local the Monachus Monachus seal. The boat trip from Micro Nisi to Shipwreck Bay usually takes around 25 minutes. We spend time on the famous Shipwreck beach, swimming in the extraordinary turquoise waters and exploring the iconic wreck which lies stranded in the middle of the white-sand bay. 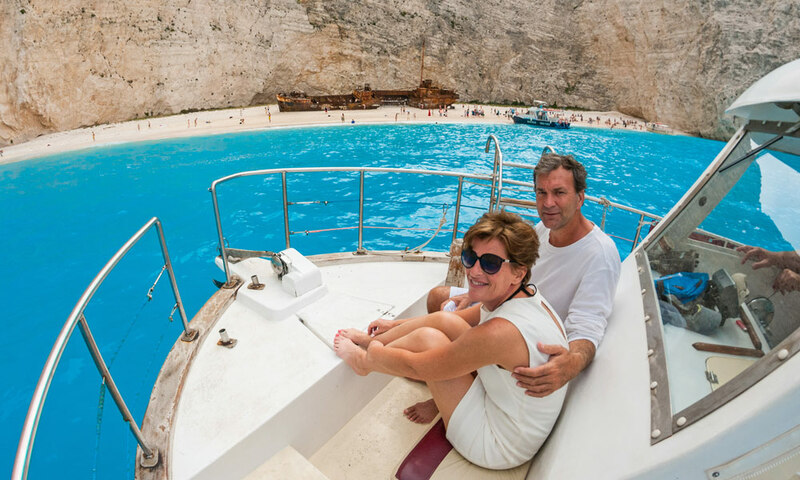 Next on the itinerary of our shore excursion on Zakynthos, is a boat trip into the beautiful Blue Caves of Zakynthos. Our Nefis Travel Zakynthos speedboat has the ability to safely enter the Blue Caves of Zante. We stop to take photos of the sea caves and arches, as well as the stunning translucent blue waters. Those who wish to fully experience the phenomenon of the Blue Caves can take a dip in the blue waters. 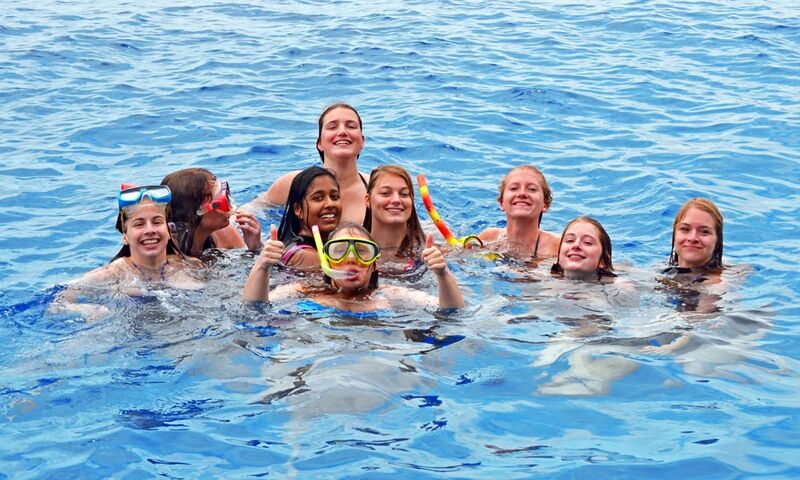 Your whole body takes on the blue hues and everyone enjoys photographing all the swimming "Blue Smurfs"! Don’t worry though, this is just an optical illusion and the blue hue will disappear once out of the water. 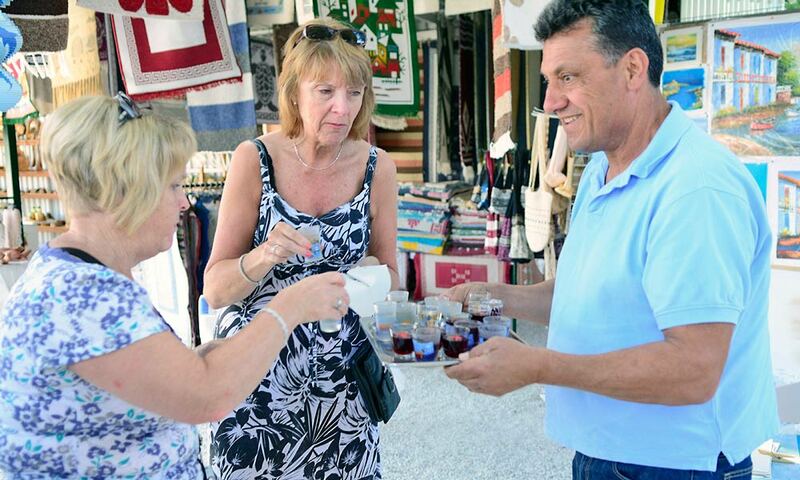 After our sea adventures, we will drive along the West Coast to the traditional Greek road-side market of Matina, where you will enjoy your free Greek snack – a slice of village bread, dipped in olive oil, with olives, oregano and local Zakynthian cheese called Lado-tiri. 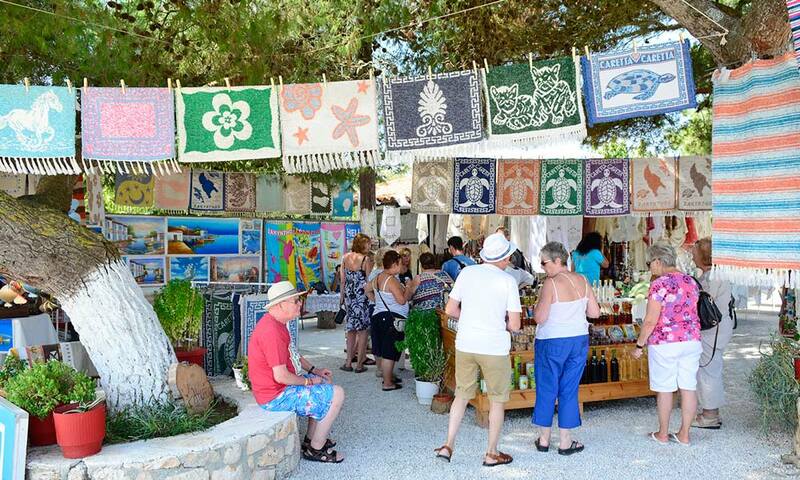 You have the option to try and buy some local products – including honey, oils, sweets, hand-made carpets and tapestries. Our next destination on our unique Zante island tour is Kampi. Kampi located high along the Zakynthian white cliffs lends itself to the most breathtaking, panoramic sea views in all of Greece. 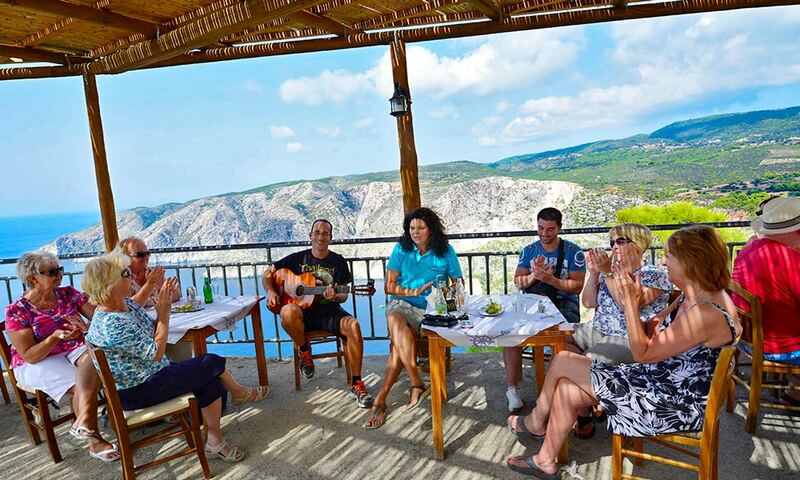 Here you can enjoy delicious home-made Zakynthian meals while being serenaded by guitarist Nico and your guide Jackie! The uplifting sounds of traditional Zakynthian folksongs are always a highlight of the Back to the Roots Zakynthos island tour! After a fantastic meal and beautiful music, we will leave Giri, a good opportunity to sit back and relax on the mini-bus. Off the beaten track views are stunning as we head towards Bochali – a little Greek village overlooking stunning views of Zante Town. From Bochali you will enjoy beautiful island views of your cruise boat waiting in the harbor of Zakynthos. Nefis Travel Zakynthos makes sure that you will be back in plenty of time from the unique shore excursion for the tender boats to collect you and take you back to your Cruise. 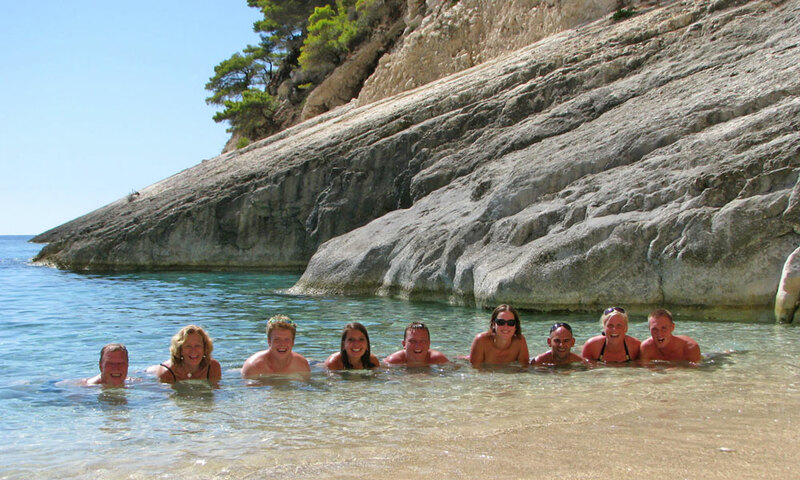 We recommend using online pre-cruise forums to form small groups with similar interests. Together you can see the island of Zante with Nefis Travel Zakynthos in a unique way at affordable prices. Contact us for more information and early booking discounts. You can choose your preferred date. Ask us for a quote and let us surprise you with our very affordable prices. Nefis Travel was awesome since I first contacted them–very responsive and helpful. We stopped here on a cruise and had a limited amount of time. Jackie set my family of 8 (4 couples) up with a great itinerary. Spiros was our guide and driver and he was so great–we loved him. He was very polite, friendly, helpful, and knowledgeable. 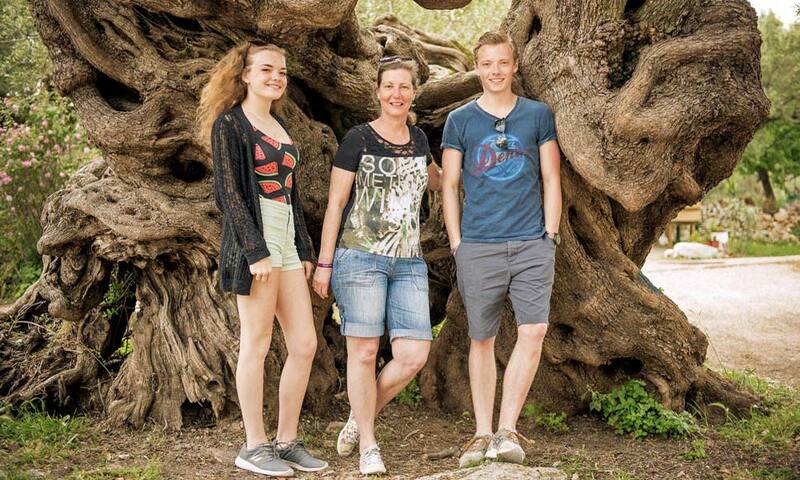 We had many great tours and experiences on our cruise stops, but hands down all of my family was so impressed with the island of Zakynthos and with Spiros. The boat ride to Shipwreck Beach was something I will always remember. The first time I saw the beach I was shocked–it was more amazing than pictures I had seen. I cannot even begin to describe its beauty. Spiros also took us into many blue caves on the ride back. We felt like we weren’t just another booking that he was trying to rush through and be done with. He sincerely cared about showing us the island’s natural beauty and making sure we had a great time. He was also very accommodating and very safe, making sure we were safe on the boat and in the van. Thank you Jackie, Spiros, and Nefis Travel for an amazing day. To top it off, we stopped at Niko’s restaurant and decided to eat. WOW, my family was blown away. Best food during our 2 week trip. My fiance and I were in town for only one day on a cruise ship a few years ago and I am just now getting around to writing this review. However it was that good that i had to come back and leave a review for others who are searching for reliable tour guide. Jackie was extremely accommodating and arranged a private tour for us. Our tour guide picked us up promptly at the ship dock and then took us for a great sightseeing trip around the island. Our guide was very pleasurable to be around. He then took us to a seaside dock where our private boat and captain that Jackie arranged for us was waiting. Our captain was as nice and laid back as you could have asked for! He was very knowledgeable and easy to talk with. The boat ride was awesome. We went to the caves (even took the boat right into some caves) and then off to shipwreck beach. The captain dropped us off at shipwreck beach before the day boats with the tourists came. We literally had the beach to ourselves. We swam ashore and just took in the sights (and lots of photos). Then the captain picked us up when we we ready and took us to another private cove where we had the entire beach and cove to ourselves with no way in or out except a boat. He picked us up again when we signaled and then took a beautiful boat ride back to the docks. Our tour guide from Nefis was waiting when we arrived. He drove us back to the docks stopping along the way at amazing roadside photo opportunities. He happily took the pictures for us. He then dropped us off. Folks, listen to me, i am the most picky and discerning traveler ever!! I picked this and Jackie and her team delivered the best tour of our trip and possibly of all our trips to date! Amazing in every aspect. its years later and i remembered all of the above like it was yesterday. I hope you get to experience it! Our group of 39 friends and family, from Minnesota, joined Jackie on the “Back to the Roots” shore excursion tour and had an awesome day. 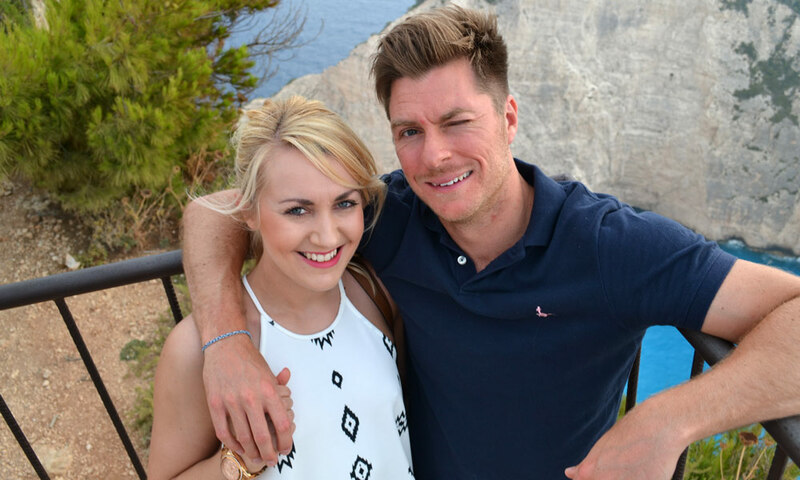 Touring through the villages of the area, hearing local legends and seeing the beautiful sites truly gave us a feel of Zante. 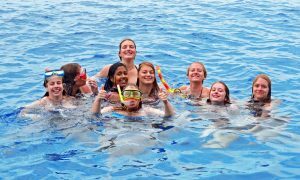 Our tour included the jet boats to the blue caves, the famous ship wreck and lunch at the taverna, with local music; we all left with smiles and happy memories of a beautiful island. Well done, Jackie!!!! My family and I were on a cruise ship that stopped in Zakynthos but when we looked at their excursion offerings we decided to book a private tour. There were a total of 12 on our tour – 8 from my family and another family of 4. It was very intimate and informative and I really felt like I was being taken care of.Our tour guide Jackie met us at the cruise ship pier and from there we traveled across the island. Due to heavy wind that day we had to change our itinerary and board our boat from the other side of the island. The drive to the other side of the island was relatively long but Jackie entertained us with history and stories of the island. 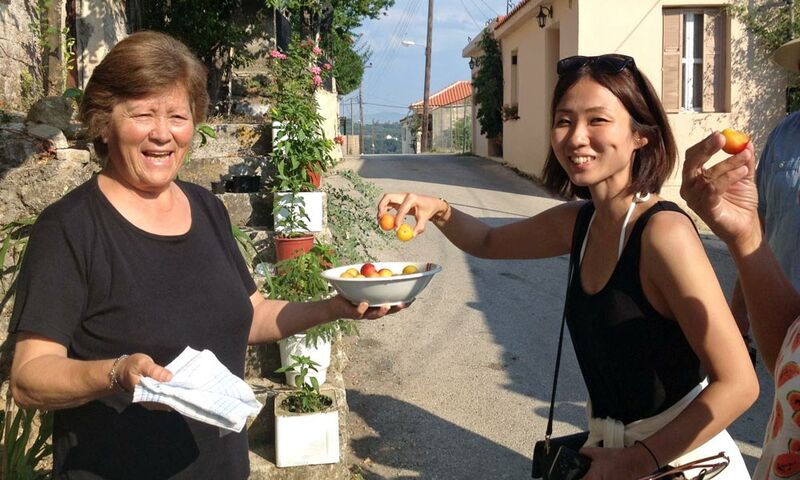 We made a stop at a small taverna and souvenir stand, which wasn’t too touristy and we got to try some local foods. The orange honey was delicious! From there we boarded our boat and headed for Shipwreck Beach. Unfortunately, our cruise ship didn’t arrive in port until noon so we had to deal with some large crowds and big party boats at the beach, but the surroundings were so beautiful and the water so inviting that we didn’t really mind the crowds. We had a leisurely hour to swim and enjoy our surroundings. After an hour our boat picked us up and then the real fun began. Our captain took is to many caves along the coast that the sea has dug into the huge limestone cliffs. Some were big enough for the boat to enter and the scenery all around us was spectacular. Then the captain took us inside one of the larger caves and stopped for about a half hour so we could have a swim. This was great fun and the water was so clear. We were in water that was about 20-30 feet deep and you could easily see the bottom.After our swim in the caves we went back to shore an Jackie took us to a local restaurant for a simple but delicious meal. She also sang some Greek songs with a guitar player that was at the restaurant and we all enjoyed it very much.At that point time was getting a little short and we had to head back to the ship, but the bus took us through other parts of the island while Jackie narrated and told stories about Zakynthos. We would have liked to have more time on the tour but given the initial diversion we definitely got our money’s worth. I would take a tour with Nefi’s again in a heartbeat. Wow!!! 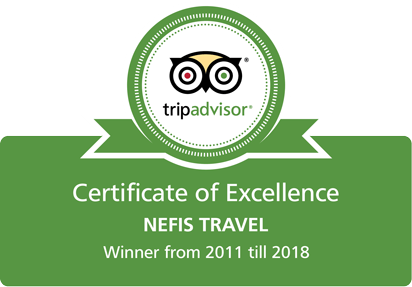 That’s the best way to describe my experience with Nefis Travel. 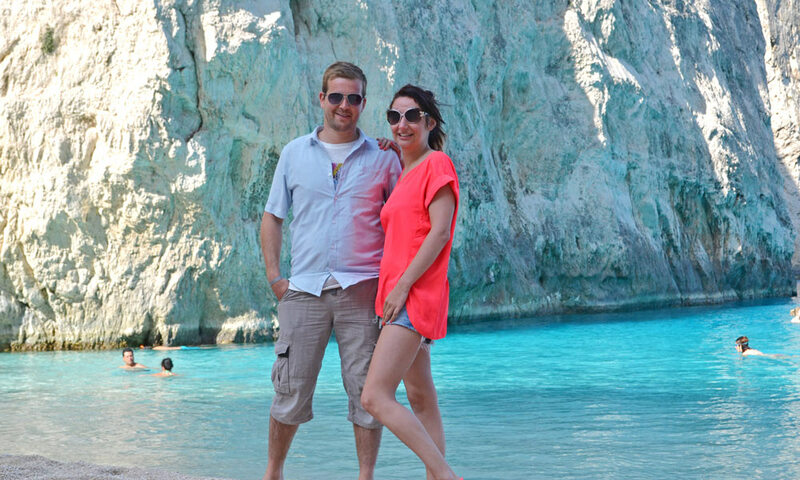 My family and I decided at the last minute to take a tour to see Shipwreck Beach and The Blue Caves in Zakynthos, Greece and the people at Nefis were very kind and professional. All the tours were booked but they arranged a private boat trip for just my family and it was breath taking. The price was very reasonable and the service was outstanding. We were not herded around, but thanks to the expertise and knowledge of our Captain Michael we enjoyed each spot we visited at our own pace. The natural beauty of this place is indescribable. I can’t recommend this company enough, so make your plans and ask for Spiros, he will make your visit unforgettable.